Just like Vegas – a dice game to provide hours of entertainment. Great for parties, travel, any occasion. Green felted playing field in 125/8 inches square frame of natural wood. Now I had a version of this game that was James Bond orientated. 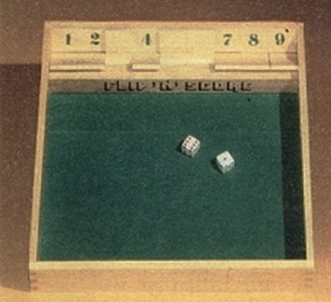 Basically the idea of the game was to roll the dice and if say you rolled 9 you could either cover the 9 or both 5 & 4 or 6 & 3 or 7 & 2, on the next throw you would do the same with the idea that you had to cover all the numbers without getting stumped. So if you left yourself with a 5 and you rolled 6 you lost. I used to quite like this game and decided one day I would search deep down in my wardrobe but alas I found it had been converted into a cosy habitat by my escaped pet hampster, Godfather.